Welcome to the alter-ego of the hammer-on! A pull-off on the ‘ukulele is the exact opposite of it’s violent brother. Instead of hammering onto a higher note, with a pull-off you descend to a lower note. This is done by plucking and then removing a finger. People often find this technique easier to play since the second note can be made to ring louder right out of the gate. The Gist: Pick a fretted note then pull your finger off the note to sound the note behind it. Like the hammer-on, a pull-off means you don’t pick the second note. Pluck the first note with your picking hand and then your fretting finger scoops into and down through the string, pulling it towards the floor, parallel to the frets, until it slips out from under your finger. This creates a second pluck from the reverse end of the string. 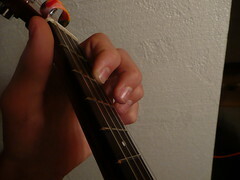 Depending on the situation, you can also play the pull-off in an upwards motion, pushing with your fretting finger. With a pull-off you have to set yourself up for the second note. Otherwise you might get tripped up. Because you “reveal” the second note, you’ve got to be fretting it while you are picking the first note. Basically, this means fretting both notes at the same time. 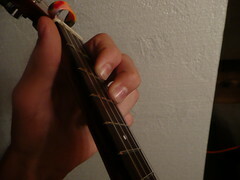 To start, hold the second fret, 1st string with your pointer finger and the third fret, 1st string with your middle finger. Press them both down simultaneously. You want to be able to play clean-sounding pull-offs anywhere on the fretboard. Practice bigger jumps and as many combos as you can come up with. It’s impossible to do a pull-off to anywhere except an open string if you start by fretting with your index finger. You’ve got to have some foresight to put two complementary fingers down at the same time. Usually, you will start a pull off with your 2, 3, or 4 finger. This way there’s always somewhere to go. The exception to this guideline is when pulling-off from, say, the 1st fret to an open string. Then you can use your index finger. Get tricky with it and go forth and shred!